1.) What is the Fitment Factor used in Pay Matrix? A fitment factor of 2.57 will be applied across all Levels in the Pay Matrices. 2. 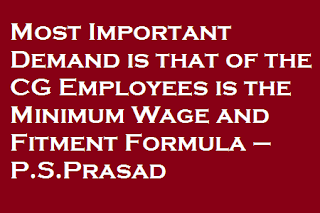 )Did Cabinet approve for the employees request of changing minimum wages? 3. )What would be the current House Building Advance? 4. )When will I get my arrears? All arrears including pensioner will be paid during this financial year (2016-17) itself. 5. )What would be Rate of Increment? Rate of increment has been retained at 3 %. This will benefit the employees in future on account of higher basic pay as the annual increments that they earn in future will be 2.57 times than at present. 6. )What’s the status of NPS Implementation? Cabinet decided to form two separate committee for looking into the issues. 7. )What would be my current Central Government Employees Group Insurance Scheme (CGEGIS)? It will stay at the existing rate of Rs.30, Rs.60 & Rs.120/- for Group C, B & A respectively. 8. )Has the old allowance has been abolished? Currently No (June’2016). Existing will continue and after 4 month’s there may be changes. 9. )What would be the HRA Percentage after Cabinet Decision? HRA would be at the rate of 30, 20 & 10 percentage and after 4 month’s there may be changes. 10. )Has there been any changes in Defence Pay Matrix? Yes, there has been changes in 13A (Brigadier), Level 12A (Lieutenant Colonel), 13 (Colonel) and 13A (Brigadier). 11. )Will there be any changes in Military Service Pay? Yes, Rates of Military Service Pay revised from Rs. 1000, 2000, 4200 & 6000 to 3600, 5200, 10800 & 15500 respectively for various categories of Defence Forces personnel. 12. )For pension, what would be multiplication factor? 2.57 would be the factor to determine the pension and will be reviewed after 4 months. 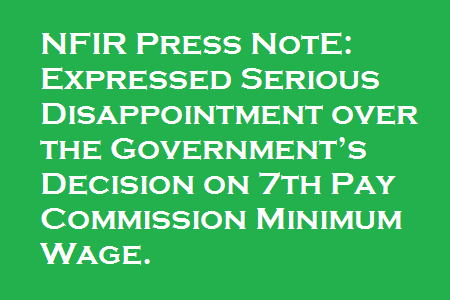 NFIR Press Note: Expressed Serious Disappointment over the Government’s Decision on 7th Pay Commission Minimum Wage. 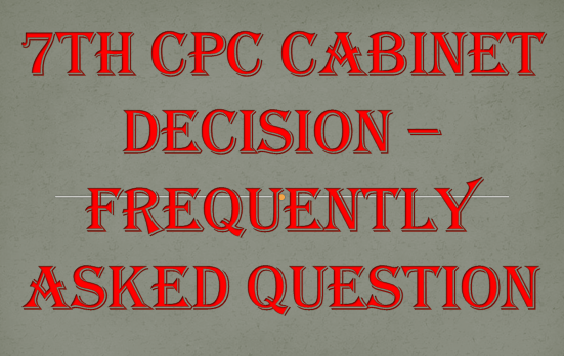 Sub: 7th CPC Recommendations – reg. Cabinet’s decision on minimum wage is totally disappointing as no improvement has been made. Equally in multiplier factor, there is no improvement. As already decided, the JCM constituent organizations will be compelled to go on strike. NJCA will meet very soon (either today or tomorrow) to take stock of the situation and issue directions. Expressed Serious Disappointment over the Government’s Decision on 7th Pay Commission Minimum Wage. The National Federation of Indian Railwaymen (NFIR)’s General Secretary expressed serious disappointment and unhappiness over the Government’s decision on minimum wage. Although there is justification of upward revision of minimum wage, the Government has not done justice to the employees. Similarly, the multiplier factor has not adequately been revised, Dr. Raghavaiah General Secretary NFIR said. Dr. Raghavaiah further said that as already decided by the NJCA, Railway employees will go on strike from 6:00 AM of 11th July 2016. 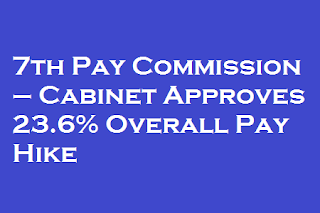 The Cabinet on Wednesday approved a 23.6 per cent increase in government employees’ overall pay – basic pay plus allowances – as recommended by the 7th Pay Commission. There were reports yesterday that the increase would be higher than what the Commission recommended, but that didn’t happen. The Pay Commission’s recommendations are to be implemented retroactively, from January 1, 2016. The increase in the basic pay is 14.27 per cent and with the hike proposed in allowances, the rise in remunerations comes to 23.6 per cent. The pay hike will benefit 47 lakh central government employees and 52 lakh pensioners . It’s estimated that the implementation of the new pay scales will put an additional burden of Rs 1.02 lakh crore annually on the exchequer. That comes to nearly 0.7 per cent of the GDP. 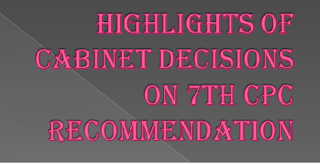 According to information, the central cabinet is very likely to give its approval to the recommendations made by the Seventh Pay Commission, during its meeting to be held on June 29. Finally, after a long wait, there will be some official developments in the much-delayed issue of pay revisions for Central Government employees. For the past few weeks, there were multiple reports and speculations about the pay revisions. This has also created massive confusion among the employees. With the Seventh Pay Commission recommending a minimum basic pay of Rs.18,000, unconfirmed reports claim that it could be as high as Rs.20,000, 21,000, 23,500, or even Rs.24,000. Also rampant are false reports on the Fitment Factor calculation methods that are used for revising the salaries. To put an end to this never-ending series of rumours and speculations, official news is expected tomorrow on the developments regarding the Seventh Pay Commission. 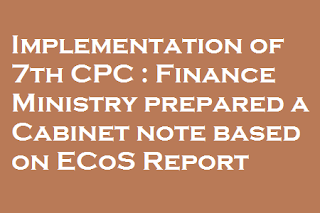 It has to be mentioned that a high-level committee, created under the leadership of PK Sinha, has submitted its report to the central government. The Ministry of Finance will choose its course of action based on the recommendations of the report. All the central government workers union, under the common name of NJCA, have announced nationwide indefinite strike from 11.07.2016 onwards. Also part of this association are the Railway workers’ unions. 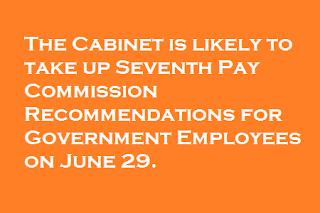 The Cabinet is likely to take up Seventh Pay Commission Recommendations for Government Employees on June 29. 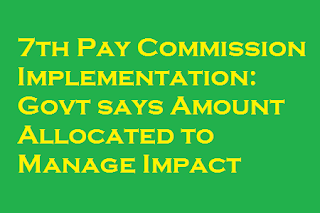 Implementation of new pay scales recommended by the 7th Pay Commission is estimated to put an additional burden of Rs 1.02 lakh crore on the exchequer annually. Finance Minister Arun Jaitley had in his Budget for 2016-17 provisioned Rs 70,000 crore towards Seventh Pay Commission awards, which is around 60 per cent of the incremental expenditure on salaries. The Pay Commission’s recommendations are due from January 1, 2016. The central government constitutes the pay commission every 10 years to revise the pay scales of its employees. The Commission was set up by the UPA government in February 2014 to revise remuneration of about 48 lakh central government employees and 55 lakh pensioners. In a populist move, Prime Minister Narendra Modi led government is likely to pay highest percentage of salary hike to the lower rank government employees with the implementation of the 7th Pay Commission recommendations. New Delhi, June 24: Prime Minister Narendra Modi led government is likely to pay highest percentage of salary hike to the lower rank government employees with the implementation of the 7th Pay Commission recommendations. 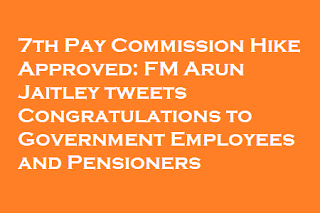 The Prime Minister’s Office (PMO) has reportedly asked Cabinet Secretary Pradeep Kumar Sinha led Empowered Committee of Secretaries, that is examining the 7th Pay Commission recommendations, to increase the pay of lower grade employees. The PMO told the Empowered Committee that the salaries of employees in the lower ranks should rise by the highest percentage, reported The Sen Times. The government decided to give highest percentage salary hike to bottom grades employees and maintain parity of incomes between mid-level tier officers and the bottom grade employees. Notably, all pay commissions in the past had not only recommended highest percentage of salary hike for top central government officials but also considered the disparity ratio between its highest and lowest paid employees. The ration of highest and lowest paid employees was about 1:12 in 2006. The 7th Pay Commission, headed by Justice A K Mathur, had originally proposed hike of 14.27 in basic pay, 23.55 per cent in salary, allowances and pensions. The Empowered Committee of Secretaries has reportedly recommended a whopping 30 per cent hike in government employees’s salary, making the minimum amount Rs 23,500 and the maximum to Rs 3,25,000. 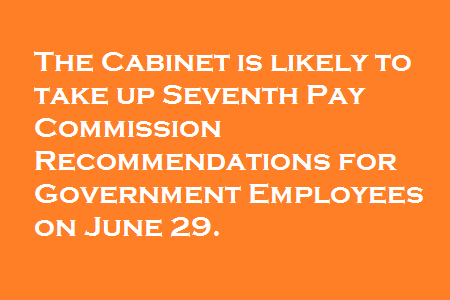 The Empowered Committee of Secretaries will submit its final report later this month and the Cabinet will take final call on the 7th Pay Commission recommendations in July. 47 lakh central government employees and 52 lakh pensioners will be benefited from the recommendations of 7th Pay Commission. For the past few days some News Agencies belongs to TV networks are blabbering about 7th CPC Minimum Pay and Implementation. They repeatedly claimed that Empowered Committee recommends 30% Increase in minimum wage. Thus Minimum Pay will be increased from 18000 to 23400 and highest pay will be increased from 250000 to 325000. If the Cabinet Committee decides to increase 30% , The Minimum Pay will be Rs. 20475. Rounding of to 1000 may take it to Rs.21000. 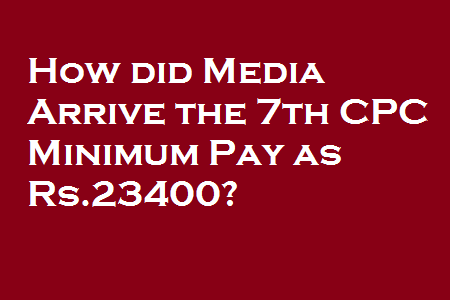 How are Some familiar and Established news Media telling that 30% increase will take the Minimum Wage to Rs.23400? Without knowing the fundamentals of fixing Minimum Pay, they simply calculated 30% increase over Rs.18000 (which already has 14.29% inbuilt increase) and predicted Rs.23400 will be the Minimum Wage. This false news created buss among cg employees. Now everybody talking about Rs.23400 as Minimum Pay. The NCJCM demanded to fix Rs.26000 as Minimum Wage according to Dr. Akroyd Formula based on the retail prices as on 1.1.2014. This is 65% increase over sixth CPC Minimum Wage +125% DA (7000+8750=15750). If the government decide to increase the Minimum Wage 30% level, then the Minimum Pay will be Rs.21000 and Fitment factor will be fixed at 3.0. 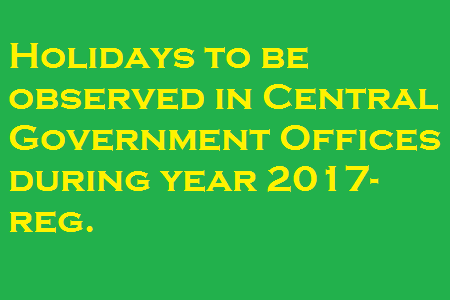 Holidays to be observed in Central Government Offices during year 2017- reg. Subject: Holidays to be observed in Central Government Offices during year 2017- reg. It has been decided that the holidays as specified in the Annexure —I to this OM. will be observed in the Administrative Offices of the Central Government located at Delhi/New Delhi during the year 2017. In addition, each employee will also be allowed to avail himself/ herself of any two holidays to be chosen by him/her out of the list or Restricted Holidays in Annexure — II. 3.1. In addition to the above 14 Compulsory holidays mentioned in para 2 , three holidays shall be decided from the list indicated below by the Central Government Employees Welfare Coordination Committee in the State Capitals, if necessary, in consultation with Coordination Committees at other places in the State. The final list applicable uniformly to Central Government offices within the concerned State shall be notified accordingly and no change can be carried out thereafter. It is also clarified that no change is permissible in regard to festivals and dates as indicated. 12. VISHU/ VAISAKHI / VAISAKHADI / BHAG BKHU / MASHADI UGADI / CENTRA SUKLADI / CHETI CHAND / GUDL PADAVA 1st NAVRATRA /NAURAJ/CHHATH POOJA/KARVA CHAVTH. are to be included in the list of restricted holidays. 5.1 For offices in Delhi / New Delhi, any change in the date of holidays in respect of Idu'l Fitr, Idu'l Zuha, Muharram and Id-e-Milad, if necessary, depending upon sighting of the Moon, would be declared by the Ministry of Personnel, Public Grievances and Pensions after ascertaining the position from the Govt. of NCT of Delhi (DCP, Special Branch, Delhi Police). 5.2 For offices outside Delhi / New Delhi, the Central Government Employees Welfare Coordination Committees at the State Capitals are authorised to change the date of holiday, if necessary, based on the decision of the concerned State Governments / Union Territories, in respect of Idu'l Fitr, Idu'l Zuha, Muharram and Id-e-Milad. 5.3 It may happen that the change of date of the above occasions has to be declared at a very short notice. In such a situation, announcement could be made through P.I.B /T.V. /A.I.R. / Newspapers and the Heads of Department / Offices of the Central Government may take action according to such an announcement without waiting for a formal order, about the change of date. 6. During 2017, Diwali (Deepavali) falls on Thursday , October 19, 2017 (Ashvina 28). In certain States, the practice is to celebrate the occasion a day in advance, i.e., on "Narakachaturdasi Day". In view of this, there is no objection if holiday on account of Deepavali is observed on- "Naraka Chaturdasi Day (in place of Deepavali Day) for the Central Government Offices in a State if in that State that day alone is declared as a compulsory holiday for Diwali for the offices of the State Government. 7. Central Government Organisations which include industrial, commercial and trading establishments would observe upto 16 holidays in a year including three national holidays viz. Republic Day, Independence Day and Mahatma Gandhi's birthday, as compulsory holidays. The remaining holidays / occasions may be determined by such establishments / organisations themselves for the year 2017, subject to para 3.2 above. 9. In respect of Indian Missions abroad, the number of holidays may be notified in accordance with the instructions contained in this Department's O.M. No.12/5/2002-JCA dated 17th December, 2002. In other words, they will have the option to select 11(Eleven) holidays of their own only after including in the list, three National Holidays and Mahavir Jayanti, Id-ulZuha (Bakrid), Vijay Dashmi, Muharram, Guru Nanak Birthday and Miladun-Nabi(Id-e-Milad (Birthday of Prophet Mohammad) included in the list of compulsory holidays and falling on day of weekly off. 10. In respect of Banks, the holidays shall be regulated in terms of th extant instructions issued by the Department of Financial Services, Ministry of Finance. 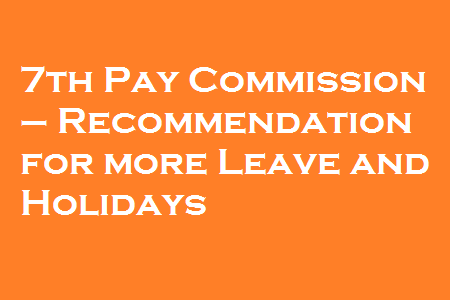 The following paragraphs bring out, the different kinds of holidays and leave admissible, demands received (if any) and views of the 7th Pay Commission on each one of them. 7th Pay Commission – Recommendation for more Leave and Holidays – Presently Central Government offices observe a five-day week which results in 104 holidays every year on account of weekends. 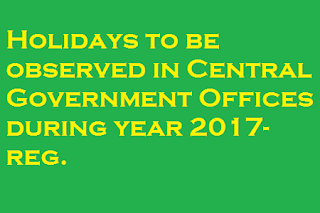 Presently Central Government offices observe a five-day week which results in 104 holidays every year on account of weekends. In addition, there are three National Holidays, fourteen Gazetted Holidays and two Restricted Holidays. Further, civilian government employees are entitled to 8 days’ Casual Leave, 20 days’ Half Pay Leave (commutable to Medical Leave) and 30 days’ Earned Leave. Besides the above, quite a few other types of leave are admissible. The following paragraphs bring out, the different kinds of holidays and leave admissible, demands received (if any) and views of the 7th Pay Commission on each one of them. Unless otherwise stated, the existing terms and conditions regulating these holidays and leave shall remain unchanged. Casual Leave is granted to enable a government servant to attend to sudden/ unforeseen needs / tasks. Presently 8 days CL is normally granted to a Central Government employee per calendar year. The number goes up to 10 days for Industrial Workers, 20 days for Defence Officers and 30 days for Defence PBORs. Certain other categories of staff, particularly in the Railways, are granted CL ranging from 11 to 13 days in a year. Demands have been made to increase the number of CL to 15 days for Industrial Workers and 12 days for other employees. CAPFs have also sought parity with defence forces in matters of Casual Leave. Presently, Commuted Leave not exceeding half the amount of half-pay leave due can be taken on medical certificate. A demands have been made to do away with the need for medical certificate. Child Care Leave (CCL) is granted to women employees for a maximum period of two years (i.e., 730 days) during their entire service for taking care of their minor children (up to eighteen years of age). There are several demands relating to CCL which include converting the same into “family care” leave, extending the facility to male parents and many representations stressing that it should be extended at least to single male parents. Suggestions have also been received that in cases where the child is differently abled, the clause stipulating that the child should be minor, should be done away with. Single mothers have highlighted their unique problems and requested the Commission for liberalising the grant of CCL. Interestingly, representations have also been made for discontinuance of the CCL, primarily on the grounds that it disrupts office working and also because it promotes gender discrimination. Presently 30 days EL per annum is granted to Civilian employees and 60 days to Defence personnel. EL can be accumulated up to 300 days in addition to the number of days for which encashment has been allowed along with LTC. Suggestions have been made to increase the accumulation to 450 days, allow encashment of 50 percent of the accumulated EL after 20 years of service and delink encashment of leave from LTC. Presently, a male employee with less than two surviving children may be granted Paternity Leave for a period of 15 days during the confinement of his wife, up to 15 days before or six months from the date of delivery of child. Paternity leave may also be granted to a government servant with less than two surviving children on valid adoption of a child below the age of one year, within a period of 6 months from the date of valid adoption. There are demands to increase the period to 30 days. Maternity leave is granted to women government employees–up to 180 days for pregnancy and 45 days in the entire service for miscarriage/abortion. Maternity leave can be combined with any other leave upto two years without medical certificate. The 7th pay Commission has received representations for enhancement of Maternity leave to 240 days with full pay and further 120 days with half pay. It is noted that Maternity Leave was raised from 135 days to 180 days and ‘period in continuation’ raised from 1 year to 2 years by the VI CPC. No further increase is warranted. Status quo is recommended. It is admissible to civilian employees when disabled by injury intentionally or accidentally inflicted or caused by or in consequence of the due performance of official duties or in consequence of official position held. Full pay is admissible for the first 120 days and half pay thereafter. The leave may be combined with any other kind of leave due and admissible, provided the total period of leave does not exceed 24 months. There are demands to remove the ceiling limit of 24 months–the duration of leave may be left to the discretion of doctor and full pay paid for the entire period. 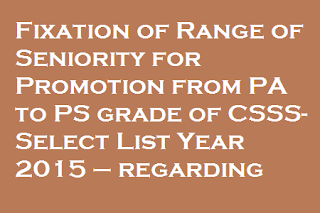 Subject: – Fixation of range of seniority for promotion from PA to PS grade of CSSS- Select List Year 2015 – regarding. Reference is invited to this Departments O.M. of even number dated 29.03.2016 and subsequent reminders dated 13.05.2016 & 08.06.2016 on the above mentioned subject. 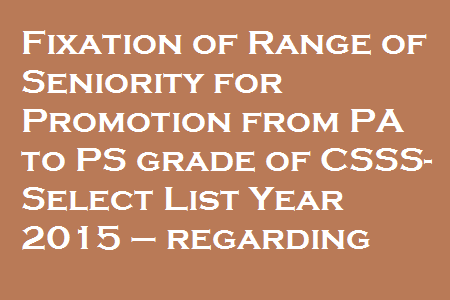 The requisite information regarding recommendation of DPC for promotion of eligible PAs to PS Grade of CSSS for the Select List Year-2015 was required to be furnished by the Cadre Units of CSSS in the prescribed proforma by 29.04.2016. 2. The requisite information received from the Cadre Units, as per Annexure, is either incomplete or has not at all been received till date. The non-receipt of this information is delaying the process of finalizing the panel of eligible officers for appointment to PS Grade of CSSS for the Select List Year-2015.The concerned Cadre Units are once again requested to furnish the requisite information without any further delay. HQrs. Office vide their letter No. 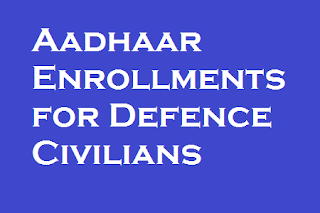 5049/AT-P/Vol-XXIII Dated- 16.05.2016 has once again called for data on entollment of Aadhaar in respect of Defence Civilian Employees as well as Pensioners for reviewing the progress of “Digital Life Certificate Scheme”, introduced by GOI in November, 2014. 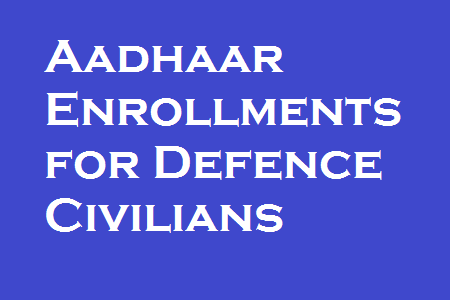 In the process of reviewing the progress of the Scheme, the Defence Secretary in a meeting on 12.03.2015 has directed that CGDA in consultation with UIDAI, RGI and other agencies would get themselves registered as Registers for Aadhaar enrollment in r/o defence civilians. In this regard, a weekly report was introduced vide CGDA’s letter of even no. dated 31.08.2015. The Weekly Report is required to be furnished to the Nodal Office i.e. O/o the CDA (IDS) New Delhi to reflect the correct number of defence civilians for Aadhar seeding/ Enrollment in the following format w.e.f. 31st of May 2016. Now all Controllers are also required to submit the ibid report on weekly basis. Since no report in this regard is being endorsed to this office till date, it is requested to forward a copy of the weekly report to enable this office for further action at this end. Further it is observed that marking of attendance through Aadhaar Enabled Biometric Attendance System [AEBAS] has since been implemented only in a few Branch Accounts Offices under the Organisation of PCA (Fys) Kolkata the Competent Authority has desired information on the present status on the progress of implementation of AEBAS in the Offices under each Branch Controller. It is, therefore, requested to inform the present status on enrolment of Aadhaar and implementation of AEBAS in the offices under the Group. In case any difficulty is being faced at any stage i.e. at the time of ‘On Boarding’ or ‘Procurement of Devices’ or ‘Registration’ stage assistance of this office may be sought for accordingly. 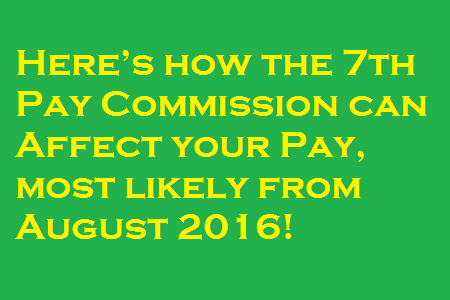 Here’s how the 7th Pay Commission can Affect your Pay, most likely from August 2016! The 7th pay commission has everything to make a central government employee happy and satisfied! 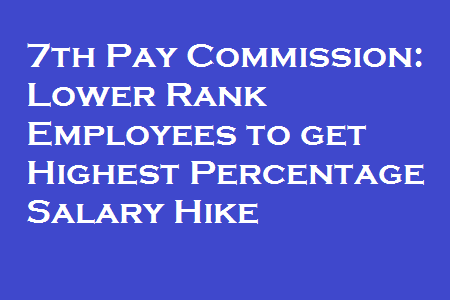 The Commission is most likely to decide on a 30% hike on the basic pay. The minimum basic monthly salary recommended by the Commission was Rs 18000 and a 30% hike will make it to Rs 23500! The 7th Pay Commission headed by Justice AK Mathur (Vivek Rae, retired IAS Officer; Rathin Roy, economist and Meena Agarwal, Secretary of the Commission are some of the other members of the Commission) had submitted its report to the Finance Minister earlier this year in the month of January. The Commission had suggested several recommendations like 23.55% increase in the pay and allowance, 24% hike for pensioners and OROP (One Rank One Pension) for central government employees and paramilitary personnel. The exact decision of the Commission is impending. 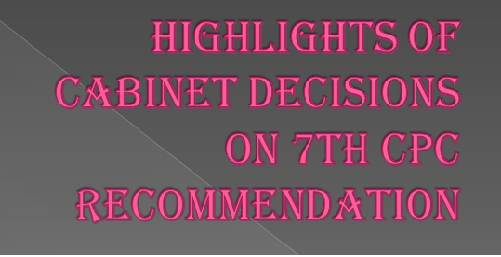 The Empowered Committee of Secretaries (13 member secretary level Committee to review the recommendation of the Pay Commission) is likely to make comparisons between the recommendations of the 7th pay commission and the comments from various stakeholders on the 7th Pay Commission. An Implementation Cell has been created in the Finance Ministry to work as the Secretariat of the Empowered Committee of Secretaries. Pay Commission has been set up by the Government of India, since Independence. The Commission is involved in giving recommendations regarding the salary structure of the Central government employees working in the civil and military divisions. Till date seven pay commissions have been set up for the same purpose. 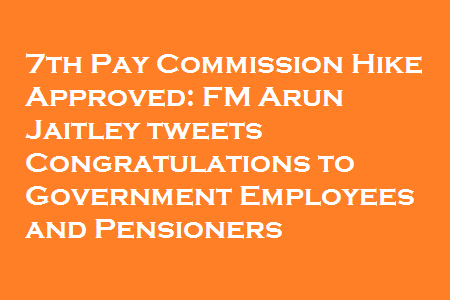 The announcement for the 7th pay Commission was made on 04 February 2014. While Justice AK Mathur was the head of the Commission, other notable members included Vivek Rae, Dr. Rathin Roy and Meena Agarwal. 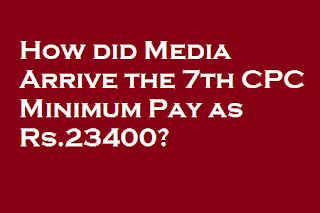 What will be the lowest and highest basic salary under 7th Pay Commission? Under 7th Pay Commission the lowest and highest basic salary are Rs 18000 and Rs 250000, respectively. However the 30% hike will round the figures to Rs 23500 and Rs 325000 respectively. The figures reveal the drastic difference between the salary structure of the 7th Pay Commission with that of the 6th Pay Commission. When is it likely to be implemented? As mentioned above, the decision regarding implementation of the 30% hike is impending. However as per the latest reports it is likely to be implemented in August 2016. What are the other salient features of the 7th Pay Commission? * Annual increment has been hiked to 3%. * HRA has been increased to 27%, 18% and 9%, if the DA crosses 50%; and further revision to 30%, 20% and 10%, when DA crosses 100%. * Introduction of Health Insurance Scheme replacing the Central Government Health Scheme (CGHS). * Child Care Leave to be granted at 100% of salary for first 365 days and at 80% for next 365 days. CCL to be granted for single male parents. The 7th Pay Commission is going to benefit near about 45 lakh Central government employees and almost 52 lakh pensioners. The empowered committee of Secretaries headed by the Cabinet Secretary had discussion from past five months on the charter of demands raised by the staff side, The finance ministry is working out the financial implications arising out of the improved recommendations of the 7th CPC especially on the minimum wage and fitment formula being improved, granting two increment on promotion and having annual increment on 1st Jan and 1st July instead of just on 1st July. This will benefit a lot of persons on promotion. The other aspect is considering grant of advances, which the 7th CPC has recommended for abolition. 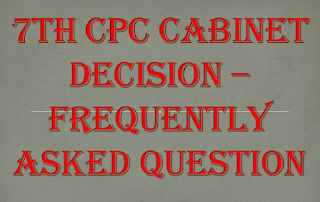 The formal announcement by the of the 7th CPC acceptance is likely to be made by the Government just before the 11th July strike by the CG employees indicating the actual minimum wage and fitment formula. The cabinet Secretary will present the view of the empowered committee of Secretaries before the Union Cabinet meeting based upon the principle adopted in actual calculation of the minimum wage and fitment formula. The 7th CPC had adopted the Dr Aykroyd formula minimum wage is calculated on the basis of the 15th ILC norms. But erred in many aspects for example the average of prices of last 12 months was taken, The housing weight age , education weight age etc . The prices of essential items are rising from past many years, even in last six months the retail inflation is rising above 5.4%. Secondly the prices quoted by the GOVERNMENT OF INDIA MINISTRY OF LABOUR & EMPLOYMENT LABOUR BUREAU CLEREMONV, SHIMLAHttp://Labourbureaunew.Gov.In/ , the Director of Economic & statics , Ministry of Agriculture and Farmers Welfare, Government of India, New Delhi & the retail market prices are varying . If we calculate the minimum wage based upon the LABOUR & EMPLOYMENT LABOUR BUREAU taking prices as on 1st July 2015 the minimum wage works out to Rs 21,000 / and fitment formula works to 3.00. This will result in 34% wage hike without allowances. If we calculate the minimum wage based upon the Director of Economic & statics , Ministry of Agriculture and Farmers Welfare, Government of India, New Delhi taking prices as on 1st July 2015 the minimum wage works out to Rs 23,000 / and fitment formula works to 3.30. This will result in 50% wage hike without allowances. If we calculate the minimum wage based upon the retail market taking prices as on 1st July 2015 the minimum wage works out to Rs 28,000 / and fitment formula works to 4.00. This will result in 70% wage hike without allowances. 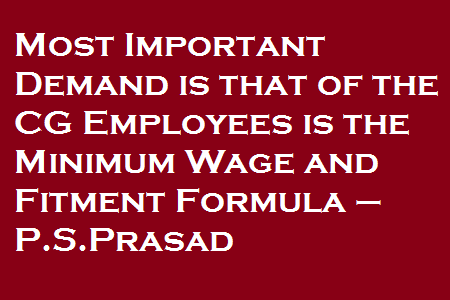 The most important demand is that of the CG employees is the minimum wage and fitment formula. The Staff side had demand of minimum wage of Rs 26000/- & fitment formula of 3.71. 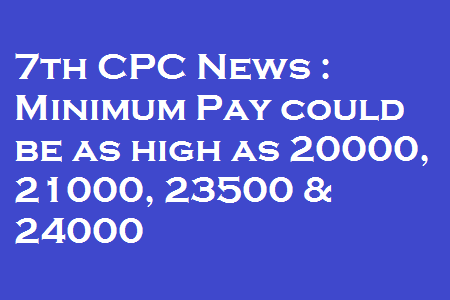 Against this the 7th CPC had recommended minimum wage of Rs 18000/- & fitment formula of 2.57. The 7th CPC recommendations has provided only at 14% wage hike at Group “C” level it is only ranging from Rs 2240/- to Rs 3500/- increase per month, and at Group “B” level ranging from Rs 4000/- to Rs 6500/- increase per month. After deductions & income tax the net increase will be just from Rs 500/- to Rs 3000/- only. This increase is lowest by any pay commission, hence vast changes are required as the prices of essential commodities have gone up and also the inflation rate has gone up. Only struggle will get us benefit. Please don’t believe on rumours. Now it is now or never. The Indefinite Strike Called by National Joint Council of Action from July 11th will play a vital role to determine the fate of the 7th Pay Commission. The amount of pressure exerted on the Government through this agitation may change the Govt Views over Pay Commission. It is evident that the present NDA Government is not in favour of Bapus. And the Public opinion about Government Employee’s attitude and work Culture is too not in favour of CG Employees. So it is now the unity among Central Staffs and their undisputed faith over Unions, Staff Associations and Federations only will get them expected results. 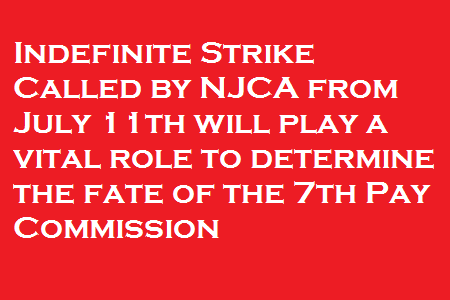 At this juncture, somehow, the call for Indefinite Strike is a timely decision taken by NJCA and it is the only weapon, through which the powerless Central Staffs can intimidate the Government to do Justice for them in respect of Pay Revision and Improving Service Conditions. That is why Federations are keep on telling the CG Staffs to be prepared for Indefinite Strike. They are, however, alarming the affiliated unions to be vigilant about the rumors about 7th Pay Commission. They informed that Social Media and Some News Agencies are publishing the false news which may deteriorate the Spirit of Govt Servants. The Success rate of agitation Programs to be conducted by NJCA in order to prepare the Central Government Employees for Indefinite Strike will be the Pressure indicator to the Central Government to take decisions on 7th CPC issues and Pending demands prior to the Strike. 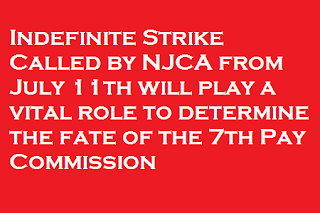 The Indefinite Strike is a well-defined and calculated move by NJCA to give the pressure to the Central Government as the Govt is reluctant to address the issues of CG Staffs and implement the 7th CPC recommendations. It is inevitable to the Government to take decision on 7th Pay Commission before the commencement of Indefinite Strike. 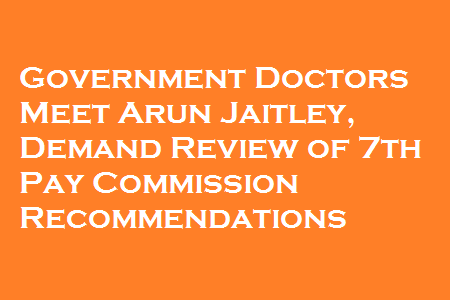 New Delhi: Government doctors have met Finance Minister Arun Jaitley and demanded revision of the 7th Pay Commission recommendations. 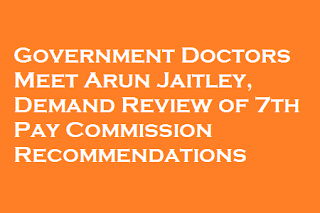 Representatives of the Federation of Resident Doctors Association (FORDA) and JACSDO (Joint Action Council of Service Doctor Organisation) met Mr Jaitley on Monday and put forward their demands saying, the recommendations are “discriminating to doctors”. “The Minister listened to our issues patiently and attentively. He was appraised especially for NPA issue. He showed his concern about our salary being relatively reduced by 7 CPC. “He assured us that our representation is being directed to Secretary Expenditure for re-evaluation. He also assured, if any concern still remains pending in the matter of NPA (and other issues), it shall be scrutinised and considered by forthcoming ‘Anomalies Committee’ which shall be appointed hereafter,” said FORDA in a statement issued on Tuesday. FORDA and JACSDO have strongly been opposing the recommendations of the 7th Pay Commission and have written to the Prime Minister and Health Minister. “When the 7th CPC was constituted we doctors were very hopeful that our demands will be looked after, which is increasing Non-Practising Allowance (NPA) to 40 per cent from existent 25 per cent, instead it has been reduced to 20 per cent. “The basic pay and NPA were merged together while calculating House Rental Allowance (HRA) earlier, but this has now been omitted and HRA will be calculated only with basic pay resulting in less than the desired salary,” said FORDA President Dr Pankaj Solanki. The doctor’s body also demanded uniform pay scales, night shift allowances which currently exists for nursing staff in government hospitals and the formulation of a uniform central residency scheme for the resident doctors of India. FORDA is an umbrella organisation of 15,000 resident doctors across 41 government hospitals in the capital. Speculations are rife as Centre to take decision on 7th Pay Commision report implementation as around 47 lakh Central Government employees working in various sectors await their salary hike, which will have implications for government finances and inflation. At a time when there are no conclusive increase in the private sector spending yet and the government also losing the benefits of low oil prices, it is facing a tough challenge in keeping up with the spending in public sector. Reacting to a query, Finance secretary Ashok Lavasa said that a certain amount has been allocated to manage the impact of the pay commission award. But to speculate whether the amount is adequate enough, would be too early and premature. Sources say, for this fiscal year the provision for hounouring the pay panel’s award is about Rs 54,000 crore whereas the outgo is estimated to be Rs 74,000 crore. Lavasa refused to comment on that saying no one knows as to what extent the government will accept the 7th Pay Commisions report. Subject: Making available publically scores and ranking of candidates in recruitment examinations through portal – reg. The undersigned is directed to say that the Government has approved the proposal of NITI Aayog for making available publically scores and ranking of candidates in recruitment examinations through portal for increasing access of the unemployed to job opportunities. 2. NITI Aayog is the nodal organisation for pursuing with the Ministries and organisations. The responsibility given to DoPT is to work out the modalities for disclosure of the information as well as development of a portal for uploading the information. page will display the details of the recruitment examinations undertaken by them in the past one year and the date of announcement of the final results. (d) The user can click on the appropriate examination and then a Search Page will be displayed. 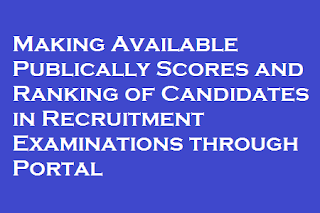 The Search Page will include display of details of candidate alongwith their rankings and their scores in descending order of rankings. However, search can also specify name of candidates or any specific range of rankings which will then by displayed. (i) The authenticity of the data displayed by recruiting agency will be the responsibility of the concerned agency. the data/ information so disclosed, the DoPT/concerned Ministry/ Department or the recruiting agency will not be responsible for any legal matter emanating out of such process. (iii) The concerned recruiting agencies are responsible for the sanctity/integrity of the process which will be followed by them. PIO of the concerned Recruiting Agency. (v) Any query/RTI request related to recruitment undertaken by concerned agency using this data/information will be responsibility of the concerned agency undertaking such recruitment. (IV) As approved by the Government, the candidates will have the option to opt out of the disclosure scheme. The option of opting out will have to be taken at the time of filing up the application. This, thus further indicates that the actual implementation can be done only on those examinations for which the application forms will be invited in future. Seeking option from candidates during the process of conduct of examination may neither be practical nor feasible. 4. Accordingly, D/o Electronics and Information Technology is requested to develop a Central Web Portal through NIC and in consultation with DoPT. All concerned Ministries/Departments/Recruiting Agencies are requested to make necessary arrangements and linking their websites as explained above. 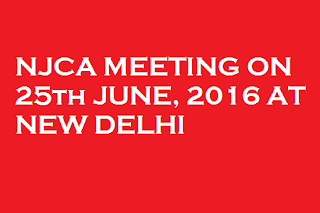 To review the situation and consider the developments and take appropriate decision, the National JCA will meet on 25th June 2016 at 11.30 hrs.in JCM Office, 13-c, Ferozshah Road, New Delhi. 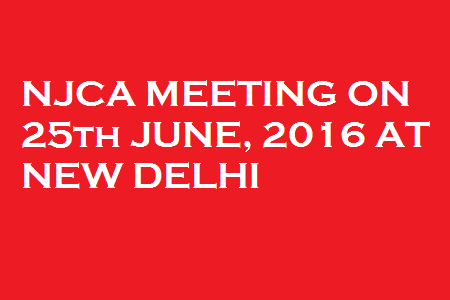 You are requested to attend above cited meeting of the NJCA.